Proline, I have a number of solid and reasonable facts and arguments etc. to counter your remarks you mentioned regarding infantry against capital ships, however I refrain of such, since I find from your remarks from the very first sentence below standard and personal. I dont want to be included in a "I want it realistic" crowd" and wish to be met in a personal manner. And I dont want to be discredited with a "lack of imagination". If you do so, you discredit the person you are talking to. End of discussion, with all due of respect. I dont want to be included in a "I want it realistic" crowd" and wish to be met in a personal manner. Your complaint is 100% about realism. You've never tried to argue that ships having a slight vulnerability to infantry is bad for gameplay, just that you find it unrealistic. You've also chosen to take that personally for whatever reason. But the fact remains- your concern is grounded in realism over gameplay. And I dont want to be discredited with a "lack of imagination". You've said yourself that you cannot imagine how an infantry unit can damage a capital ship, so why do you find it offensive to point out that that lack of imagination might not be shared by everyone? For me, and most people, an infantry unit represents hundreds to several thousand people with a variety of equipment including a bit of artillery and AA. They aren't just helpless riflemen. It's not hard for most people to imagine one of those thousands of people coming up with a way to do some slight damage to a capital ship that's just offshore. Perhaps we could try to set the emotions aside and consider another question- does making capital ships invulnerable to most ground units make the game more fun? Right now there is a bit of strategic tension between putting your ships right next to the shore and risking a bit of damage to be able to shoot further inland vs keeping them a hex away where they are safe. You're proposing removing that element of strategy and replacing it with... nothing. A simpler, less strategic game is the result. I welcome additional rules to enhance naval warfare, but I fear that the developers may be taking it too far at the expense of simplicity and fun. The dev post is decent enough - if read as a wish-list, from which later the darlings will be killed, with only a select few features that really add fun are to be retained. I appreciate that some players are keen on naval combat and are looking forward to its inclusion in PC2, and I also understand why the developers are expanding it compared to PC (by the sounds of it), but it's not something that interests me. I just don't see the attraction of only having a single terrain type (sea) and such a limited choice of similar units. I prefer the far greater variation of terrain and units of land battles, with the variety of opportunities it offers. I play PC rather than a naval strategy game as I enjoy the land combat, which after all is what players would expect a game called Panzer Corps to be about. The limited naval engagements in PC were as much as I would want in a strategy game, and although I'm probably in the minority I'll be disappointed if PC2 contains much more. Multiplayer naval scenarios would be fine as they are optional and I don't have to bother with them. My question to the developers is - if there are going to be naval only scenarios, will it be possible to bypass them? Re: Panzer Corps 2 - Dev Diary #8 "Panzer Corps Commander"
It will be absolutely fascinating to have a large "strategic map" that enables players to "make decisions where to fight and how to proceed to his targets" throughout the campaign. Imagine you are playing with Wehrmacht, sooner or later you will historically and automatically end up fighting on two fronts (in Panzer Corps grand campaign I guess it is in 1943 that we need to make a one-off decision on which front we choose to start fighting for the whole next year and then move parts of our units to the western front and form a new second unit there). However, in this new mode, it is practised essentially and totally in a different way. 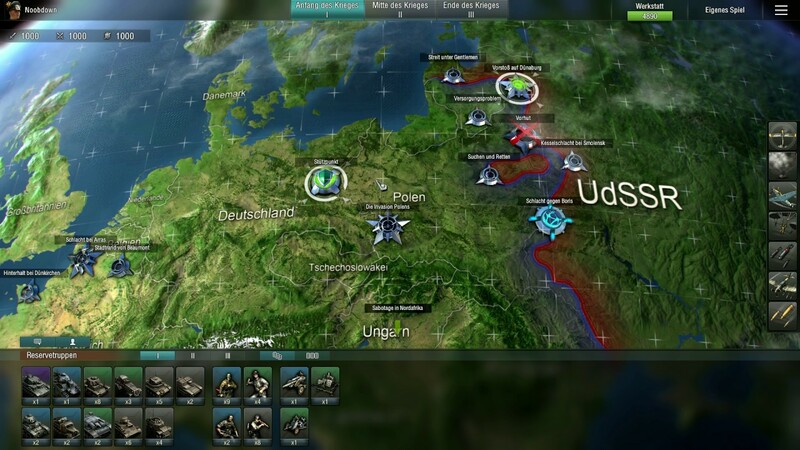 By providing a large strategic/command map that covers the whole of Europe and North Africa, players will be able to choose where (and by which unit) to fight first or next. One may start his campaign on the eastern front (Poland for example) and the other one may begin it on the western front (Norway or Low Countries or even France, even though the latest sounds a bit crazy). Actually, players can have at least two or three different units to fight on different fronts (East, West, Africa or all of them in one front if they fancy it) just like Panzer Corps Grand Campaign (in 1942 or 1943 where players need to build a new unit and move most of it to another front) but this time with the ability to choose which unit (out of 2-3 units a player might be permitted to form) he wants to fight with and where to fight with them, east or west or elsewhere. So he can manage to attack or defend at the same time in a large strategic map in different places with 2-3 different units. I am sure this can be provided by your developers without a hell of difficulty as this idea, in essence, is what happens in Panzer Corps (kinda behind the scene!). Now a player can see it all in a visible bigger map and drive his forces towards his targets as he wills. If a player's playing with Wehrmacht for instance, he can make a decision on whether to attack the Soviet Union with all his 2-3 units (depending on whether the war on the western front is over or not as well as whether he needs to have at least one strong main unit to finish it up there). He also can decide where to attack first with which units: Minsk, Leningrad or Kiev? while monitoring Soviet forces and their movement on the map. And here comes another part of this idea: instead of automatically jumping on to the next scenario based on the intelligence provided for the player (before each scenario) and practically force him to fight that specific battle, by using such a map and the same intelligence it will be his call to make a decision whether he wants to fight that scenario or not. He might want to attack somewhere else and fight another (relevant) scenario. For instance, after occupying Norway by Wehrmacht a player may want to attack Russia (hence playing Barbarossa scenario) instead of Low Country. This idea makes it possible, though it is the wrong decision as the second or thirds unit may not be as strong as it should be and finally, he will have to fight with Russians in Poland or even in German soil quite early on rather than 1944-1945 (using same maps for later stages, though with different troops based on the year it takes place). Also if he manages not to fight where your intelligence and suggestion is indicating, then he will have to probably fight it in another scenario and of course within a different circumstance. For example, after occupying Minsk your intelligence suggests the player need to attack Kiev immediately in order to outflank Russians and make them surrender, but he chooses to stay put (in a defensive position) and fight somewhere else with a different unit, say towards Leningrad or in North Africa (of course if he buys that scenario!). So as a result, he may either have to fight in a previously occupied territory (i.e. previous scenario) as it is likely he lost that area or to defend their current position or simply to face much stronger Russian forces next turn as he decides to finally move forward and attack Kiev. Also, a player may decide to attack Eygypt by landing in Palestine and not through the desert or El Alamein. So he may want to put one of the main units in Greece until he secures the sea or air to launch his amphibious attack. Another one may make a decision only to attack the Caucasus, not in other directions (in order to cut Russian's lifeline of fuel and other supplies coming from the South, sent by Americans and Brits via Iran, and consequently affect the movement of their forces and the number of tanks, artilleries etc Russian could use, and I know this one bit is sort of tricky and maybe too complicated for Panzer Corps). As another example, another player may decide to transfer his enormous Gustav artillery from the Eastern front to Belgium and bombard London or southern shores of England, especially when it comes to the Sea Lion scenarios in 1942 (like actual events in WWI and at some point WWII, if I am not making a mistake). If it's Great Britain, one may decide to start his land campaign against the Reich in Africa, Normandy, Norway or even if possible in Russia to some degree! Again, all within the same scenarios already developed though with a bit of alteration in terms of slots and... In fact, there is no need for further scenarios (although the more the better!) as the battlefields and all their scenarios are still the same (it would be great to add a subsequent defensive scenario within the same maps for at least some of the major targets/scenarios; in case a player decides to stay put in his recent victory point and not progress further; so he will face a counter-attack from the enemy next turn if that place is of any importance). This is a mechanic whereby players are able to choose where to start or continue their campaign in the long run with all their basic resources (Three basic units with different prestige depending on the country and the year they want to build them; e.g. Nazi Germany did not have the same amount of resources in 1944 as it had in 1940). I am aware this sounds quite imaginative and unorthodox, but nothing can be more exciting and rewarding for a player than having access to a strategic large map with the ability to see his progress and to choose how he wants to run his campaign from the beginning till the end with his 2-3 different basic units. I firmly believe it will be very interesting if you please just give it a little shot for yourselves and see how it goes. You can have your original plan for Panzer Corpse 2 but providing such an intriguing and totally new mode (called sth like "Panzer Corps Commander") can be a significant game-changer by all means. Last edited by NiMa on Thu Jan 31, 2019 2:58 pm, edited 3 times in total. like in blitzkrieg 3 ? Maybe Slitherine should hire McGuba?! I think you answered your own request there NiMa. The Grand Campaign is as close to this concept as you're going to get. And the reason the Grand Campaign is as close as you can get is because of the sheer number of scenarios built into it. It had to be large enough, and expansive enough, to attempt to represent an utterly massive strategic map. How else can you have strategic level decisions about where to deploy your forces? The effort to create a (good) scenario is too large vs the numerical requirements of strategic decision making are completely out of sync. Pessimism aside, Panzer Corps 2 has flaunted a lot of newfangled 'randomization' procedures they've showcased in previous dev diaries. Is this the answer to your request? Let the game build these scenarios based on randomly procedural content? For example, when you strategically decide to redeploy from East Front to West Front, and maybe more specifically lets say too... Sicily 1943... The game then takes all these parameters it uses to create random scenarios based on the new variables. Instead of Enemy = Soviet, a switch changes it to Enemy = Brits/Americans. Instead of generating terrain based on Eastern Europe, now it chooses Southern Europe parameters with more water features. And so on. In that sense, now you have capability for strategic redeployment with the flexibility you're aiming for. What else but a machine could produce such variety of content at the rate required to support tactical/operational battles combined with true strategic redeployment? Now I'm tooting my own horn here as a Content Creator I know, but I get a pretty strong feeling the quality of your random content is just not going to be on the same level as the carefully handcrafted scenarios of something like the Grand Campaign, or most any good Panzer Corps campaign. Like, there's no way for creative and informative writing to be present in the briefings. You'll be lucky to have just a list of instructions that correspond to how the randomization protocol decided to lay out the map. Example, Defend VH in SW corner of map. Destroy enemy leader unit placed in East end of map. And such and such. All that said, random campaigns, if they do come to Panzer Corps 2, could be a very cool thing and definitely help fill in that type of gameplay you've requested. But I would definitely wait to see just how strong the randomization features are before hyping my expectation up to orbit with dreams of true strategic redeployment. I fully expect to see gameplay on the level of Wesnoth random campaigns before I'd expect to see something more akin to the depth of the randomization of the 'campaign' available in something like... Slay the Spire. There's a reason it sounds like a fantastic idea... but no game has actually done anything like this. Hearts of Iron is pure strategic through and through, completely divorced from the tactical/operational/individual unit battles of Panzer General types. Last edited by Kerensky on Fri Feb 01, 2019 12:33 am, edited 1 time in total. And the point of slay the spire reference is that is absolutely sounds like what you're hoping for with strategic redeployment. You have a start and end point of your campaign. As you progress, you pick your path, and depending what route you pick, various random things can happen. Events and battles and the like, and the content of those battles are somewhat randomized. There is a 'pool' of stage 1 elites the game pulls from every time you pick a path that lands on an elite encounter. Just restructure how that all works and translate into Panzer General, and that's effectively what you will get for a campaign that allows wholesale strategic decision and redeployment. Your enemies and the locations you battle in change as you choose your path/deployments. But for each scenario to be hand crafted and not just through into a computer generated set of variables... we wanted maximum value for the product the player got in the Grand Campaign, coming in at what $5 for a full campaign of something like 15 scenarios each? You can't even get a Blue Power Armour skin in Fallout 76 for 3 of these full campaigns (that's an $18 skin by the way, and I thoroughly enjoyed the likes of Jim Sterling and Angry Joe going ballistic over it). But even at that price point... the whole Grand Campaign with its 10 pieces comes in at $50, assuming no sale discounts. That's a lot more than the price of most entire games, including something as excellent as Slay the Spire. And it's a mere $10 away from a full priced 'AAA' game the likes of Destiny or Anthem. Yes that's a whopping 144 scenarios at that price point, which is a crazy amount of content considering each scenario can easily take 1 hour or more EACH to playthrough, especially some of the biggest and later war battles present. But that's quite a lot of money to ask players of for something that isn't actually a base game but a series of addons. That video is actually a really good representation of what is going on in the Grand Campaign. You have the high strategic level going on in the left side image, of the flags and arrows over various parts of the European map. Then you have the cool art graphically depicted individual scenario battles that represent the battles these arrows are signifying. And finally, each scenario is fully realized in a Panzer Corps type battle, as seen in the gameplay footage clips. And, as you originally said, this is as close as Panzer Corps has gotten to your concept. But as I've pointed out, this was a monumental effort that actually costs more than entire full games, which has to be taken into consideration regardless of it's 144 scenario count. Last edited by Kerensky on Fri Feb 01, 2019 12:36 am, edited 1 time in total. I can't speak for any mainline campaign, but this is an interesting topic for me personally. As some may or may not know, I'm a big fan of what might be considered... controversial scenarios. I enjoy tackling them head on because I simply see history is history, these things actually happened, but things like the siege of Warsaw in 1944 and the Quit India revolt of 1942 involving none other than Gandhi himself can definitely strike a nerve with certain players. Wanting to opt out of naval scenarios is very much inline with players wanting to opting out of these controversial scenarios. In fact this is why 1939's history breaking Spoils of War is something you can absolutely opt out of. Decisive victory gives you a choice to play it, or just skip it. So more unique scenarios like naval focus, auxiliary (non-core) only battles, or nerve striking historical events... I'm definitely not objecting to players having choice to opt out of them. It really is a case by case situation though, there's not going to be a general rule in place here. And there better be a LOT of campaign content that opting out will not harm the overall length of the campaign. Grand Campaign with almost 15 per piece and 144 for the full package... can shrug off an opt out here and there. But as we saw in the base Panzer Corps vanilla game, if you punch holes into that, the campaign can become extraordinarily truncated. Poland Low Countries France Sealion Barbarossa Early Moscow USA USA USA done.... That's really short, imagine punching more holes into that with opt outs? I am not as consternated as you seem to be about this. Play the game at a higher difficulty setting, and you get more content. What I dislike about the "Poland Low Countries France Sealion Barbarossa Early Moscow USA USA USA done" sequence is the heavy emphasis on USA. While rolling across America in Tiger tanks might be a fun what-if scenario, it is utterly ridiculous historically speaking. If and only if you get a decisive result in both these scenarios, do I see a Man-in-High-Castle campaign-ending scenario. And even then it needs a complete rethink. It is utterly implausible that the US Army would develop at anything near the historic pace given no actual combat experience in Europe or Africa - the units the Wehrmacht would face in a hypothetical invasion of the US would never be the heavy tanks that the US historically had access to. Instead the scenario should feature an US Army geared up to conquer the Japanese mainland the hard way - great infantry units, great airforce, and a navy twenty times the size of the German one. Kerensky, thanks for adding your thoughts to my question. I enjoy "what-if" scenarios, unique scenarios, mods that cover different aspects and most scenarios/campaigns. I'm just not into naval battles as I find their lack of variety a bit tedious, and as I said I wouldn't expect a game entitled "Panzer Corps 2" to have much in the way of naval warfare. I didn't mind what little there was in the original Panzer Corps as it complemented the land/air action in the scenario, but I would find entire naval scenarios (if they are intended as part of the campaign) a chore, and of course no one wants to play a game that is a chore! Believe me or not, I've had no clue about "Battlefield Europe" mod whatsoever! Thanks a lot for enlighting me! Actually, I took a look an I'm really stunned by this mod! WOW! So now the only question is: How can I get/download it? I have Mac Pro, iPad and also am in Steam. If you know anything about this, pls educate me! And btw, yeah Slitherine should definitely hire this lad if they have not done it yet. Thanks again mate! By the way (and just FYI or maybe for inspiration...), there are also several AARs on the Battlefield Europe mod! @AlbertoC: Thank you for your post. Maybe you should talk to a UI designer about that strength (10, 15, 20) icon below the units. I understand what you are trying to achieve. We all know Panzer General etc. BUT this strength icon design is big, overlaps other units and takes in general too much space without proving new information. It makes the units looking confusing -- not for die-hard fans, but for the average player that you probably try to address with those new 3D units and fancy designs. A good UI designer will also most likely play with grey tones a bit to soften the white borders of this UI design, that are very dominant. Though technically this fine, it can be adjusted a bit to make a better distinction between the buttons on the right and the map, as well as the buttons on the left, the unit infos and the its different meanings. Currently the UI design looks a bit too prototypish and wireframed. It should be sufficient if that experienced UI designer would check/adjust the UI designs from time to time. No need for a full time job. I'm keen to see if Panzer Corps 2 make it. I still remember how badly "Panzer General 3D" and all the other similar games failed as 3D games. Yes!, McGuba is definitely an extremely talented individual, and perhap's Slitherine should hire him!. If you believe that Germany could have won WWII easily by defeating the three major world powers, then this mod is NOT for you! In that case, I humbly suggest you keep playing the stock campaign which comes with the game or other mods which allow such achievements. In this mod you are supposed to be lucky to defeat one of your main adverseries while holding the others at bay. I tried to make this mod as accurate historically as I could. And history tells us the Allies produced four times more tanks and aircraft during the war than Germany, and it is well represented here. history tells us the Allies produced four times more tanks and aircraft during the war than Germany, and it is well represented here. Many...Many more Allied Tank's, but not near the same quality nor near inclusive of the same capabilities. Let me try to explain just a few of these regularily ommited nuances that come with most games!. The German-Tank was equipped with 2-sets of communication system's. The first was for internal communication with all the tank crew members. The second was the Radio, for external communicating with other Tank's in the group and other local tank detachments...as well as to communicate with the Luftwaffe in order to get prompt "air-support" to assist the tank gruppe' in their effort. I know that the Russian's did not have anything like this, they either used hand waving signals or flags to try to accomplish communication efforts with other tank's. When the Americans entered the war with their tank's, i dont think that at first that they were much better off!. For example, in order to communicate with the tank driver in an American tank, the tank commander would use his foot to tap the driver's right or left shoulder in order to give instructons to the driver as to which way to direct the Tank. One Tiger tank on a scouting mission ventured forth and inadvertantly ran into a horde of Russian tanks moving to their start positions. This Tiger tank was then fired on 69 times before it was able to back-up and retreat to safety without taking meanigful damage. In too many games inferior Allied tanks are given near parity with the German tanks, and that is then somehow unrealistically implied to be historically accurate???. So!...if your game or any other game is going to insinuate that it is as close to a real 'Historical-Representation', then...make sure that it is in fact so...and that it is not Fudged /Slanted to one's personal preconceptions. The Germans also used sophisticated tank group attack formations to minimize tank losses, instead of using for example the mass-horde attack pattern of the Russians. Conclusion: So even if the German's were out produced by 4 to 1, they still had a chance of success/victory during the war, it would not be easy...just as you stated, but at the same time, victory overall...was not unrealistic expectation!. What about the T-34 ? "When it was first encountered in 1941, German general Paul Ludwig Ewald von Kleist called it "the finest tank in the world" and Heinz Guderian affirmed the T-34's "vast superiority" over existing German armour of the period. Retributar wrote:In too many games inferior Allied tanks are given near parity with the German tanks, and that is then somehow unrealistically implied to be historically accurate???. You make the basic mistake because the tank is not only armor and cannon, but also the engine, drive system, tracks, optical and radio equipment and other parameters such as weight, height, speed, the ability to overcome hills, fords, etc. I agree. In addition, the production of ~1,350 Tiger I and ~500 Tiger II (and also ~6,000 Panthers) was in relative terms more complex/complicated (i.e. over-engineered) than the production of most of the Russian tanks (especially compared to the ~50,000 T-34s). So the (maybe) higher quality came at the expense of significantly reduced quantity, while eventually the production of larger Soviet quantities won the arms race/war... Not to mention some of the other German investments, e.g. the production of more than ~1,200 submarines... i.e. just as another example of (potential) poor focus/waste of resources (when looking at the bigger picture).